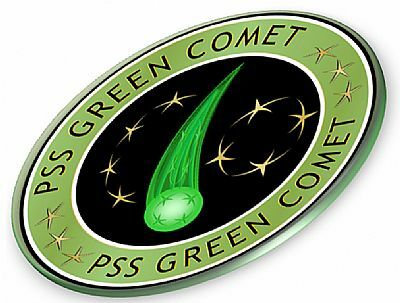 The Private Starship Green Comet is one of a fleet of PSS vessels that fly under the flag of the Trades Alliance, and in common with many of her sister ships, she tends to berth at Merkat Three Free Port in Galactic Zone Alpha. The Green Comet (PSS A119, NC-7X) is an independent trading vessel and she flies under the command of her owner, Captain Sarie Jikelleli; the first mate of the Comet is Commander Ace Periwinkle. Check out "The Pirates' Web: Arianrhod" by Sandi Cayless for the whole story!